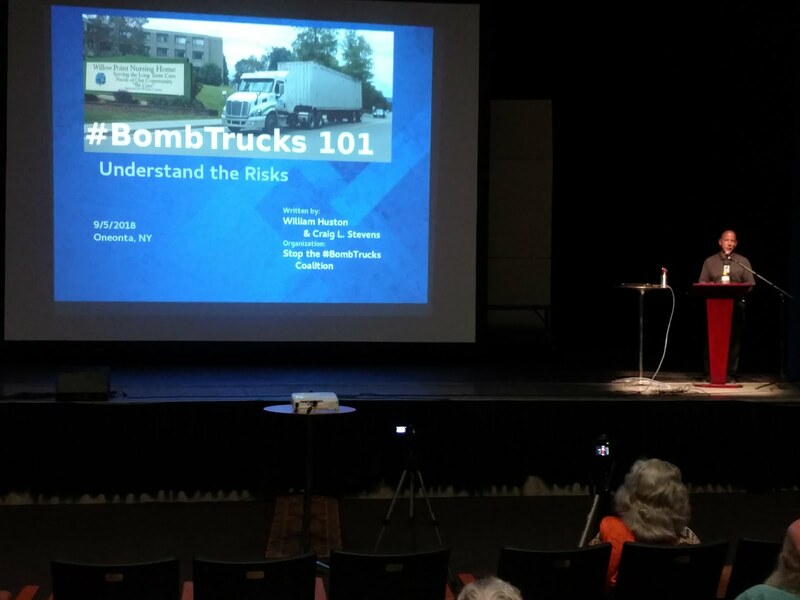 Craig Stevens and I want to express thanks to everyone who came out to see our #BombTrucks 101 presentation! they each were each high quality. legislators from Tompkins County, Town of Lansing, and Otsego County (one was strongly antagonistic -- we were happy he came! ), former Mayor of Binghamton, a co-founder of Dryden DRAC, a co-founder of Shaleshock and retired land planner, a psychologist and member of VERSE, members of the Susquehanna chapter of the Sierra Club inc. the Chair, the Catskill Mountainkeepeer, a retired engineer and technical advisor to Otsego 2000, and the President of O2K, persons who live along the route, and some very senior NY fractivists. Several people told me after the Oneonta presentation they were profoundly affected. I saw a version of this presentation last night in Oneonta and it really was an excellent evening. 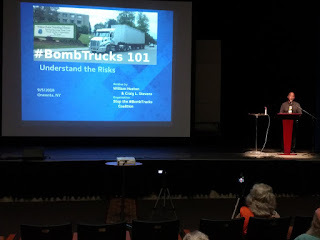 Last night a wonderful introduction by Nicole Dillingham, a heartfelt statement from Vera Scroggins, an exceptional powerpoint loaded with information from Bill Huston and the impeccable delivery of Craig Stevens. If you attended one of these shows, I would very much appreciate your feedback. Did you experience any discomfort in your body? Did you find the information credible? Compelling? Shocking? Disturbing? -- A major NEW threat to public safety? ★ Were you inspired to take action? ★ Are you glad you attended? Please only use the above as a guide. of the best of all three shows. Craig and I want to take this show on the road. Most of my public service work is unfunded. Again, I have an URGENT need for $490 today. Yes, I found the info credible, as one who maintained and drove a big-enough-to-have-air-brakes truck of my own for many years.